[AUTO](VC/RC): When this unit attacks, if the number of cards in your opponent's damage zone is three or more, this unit gets [Power]+3000 until end of that battle. ... 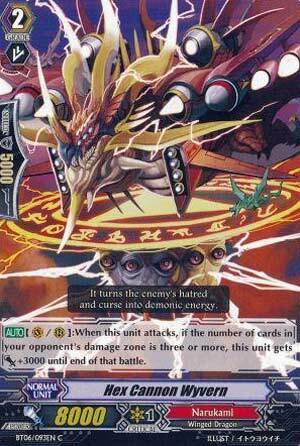 So this one kind of pays tribute to what Narukamies were like at first where they would become better at a late game situation with Photon Cannon Wyvern and this card. When it attacks, if the opponent has 3 or more damage, then it becomes 11,000 by itself. This is actually not bad but gets overshadowed by its brother, Dusty Plasma Dragon whom becomes 12,000 just as long as you have a Vermillion Vanguard, which isn't that hard if you're basing off of the Kaiser Vermillion series. Personally, if you aren't using a Vermillion based deck, then Hex Cannon Wyvern might deserve a spot in your deck as it can at least keep up against the 11,000 Vanguards that most decks utilize nowadays. Basically, if you aren't using Vermillion cards, he deserves a look at. Next Time: How is a wind god a thunder dragon?